DESCRIPTION Offers over £160,000, Hindhead Property are proud to present this second floor three bedroom property to the market. From the leafy green street, you arrive through a secure communal entrance. The maisonette is situated on the second and third floor of this three storey building cared for by Plymouth Community Homes. You are welcomed by a large, light hallway with plenty of under stairs storage. The lounge offer's ample space for a three piece suite and further furnishings whilst featuring double aspect sea views across the River Tamar. The well presented good sized kitchen has plenty of worktop and cupboard space. 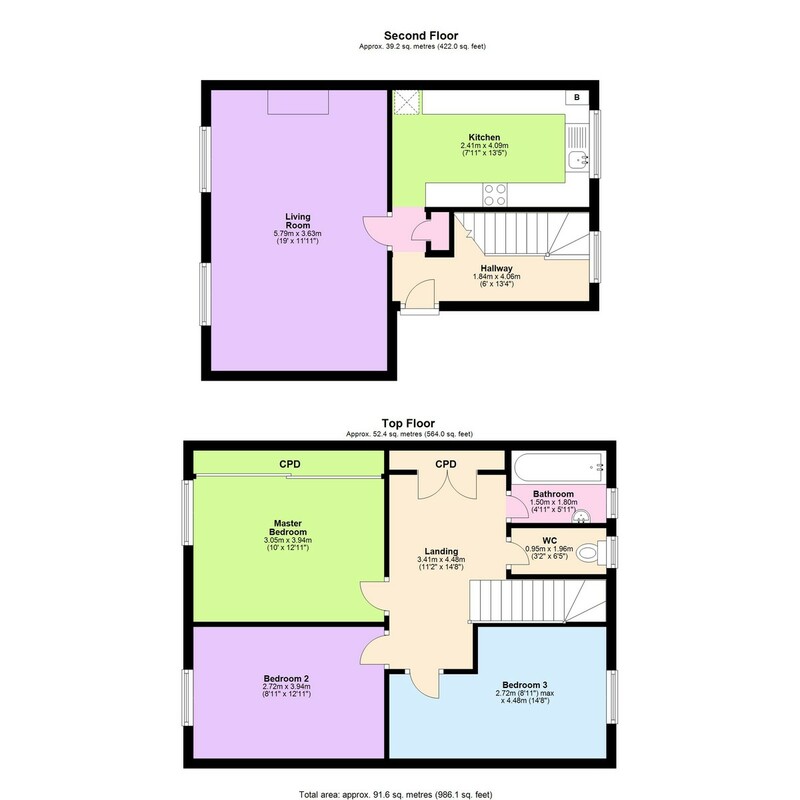 The top floor offers three large double bedrooms which are accessed from a spacious landing with built in storage. The master and second bedroom benefit from sea views and room for additional furnishings. To the front of the property is the bathroom with overhead shower and basin and a separate toilet. Unlike most flat's, there is large high standing loft space which spans atop the entire property. Accessed by a fitted loft ladder, it is boarded and has been fitted with lighting and 240v power sockets. To the rear of the building is a large gated communal garden which is in short walking distance to Cremyll Ferry. The popular local area offer's a grassed park and children's play area along with convenience stores, Royal William Yard, local schools and Devil's Point beach. The property is offered as leasehold. The annual service charge and ground rent is £734 (inclusive of buildings insurance) which is payable to the management company who maintain the communal areas; Plymouth Community Homes. The flat features double glazing and central heating throughout and has recently been re-roofed. PLYMOUTH Plymouth, Britain's Ocean City, is one of Europe's most vibrant waterfront cities. Located by a stunning waterfront and harbour, Plymouth is the perfect place to buy property. VIEWINGS By appointment only with Hindhead Property, to arrange please call 01752 875075. OUTGOINGS We understand the property is in Band A for council tax purposes. ACCOMODATION Reference made to any fixtures, fittings, appliances or any of the building services does not imply that they are in working order or have been tested by us. Purchasers should establish the suitability and working condition of these items and services themselves. FLOOR PLANS The floor plans are set out as a guideline only and should not be relied upon as a representation of fact. They are intended for information purposes only and are not to scale. Copyright Hindhead Property Limited 2017.